You can read this blog anytime you want, but hundreds of families like getting a daily email digest and subscribe to Homeward Bound. Note that this is through a Google service called FeedBurner and is completely separate from any email address lists that the district maintains. If you subscribe to the email, each day that the blog is updated you will receive an automated email, usually between about 1-2pm, with all the posts that went up in the previous 24 hours. Typically it is updated every day school is in session and sometimes over weekends and holidays. click in the "I'm not a robot box"
click the button "Complete Subscription Request." You will then get a screen that tells you that your request has been received and instructions on your next step, which is VERY IMPORTANT! 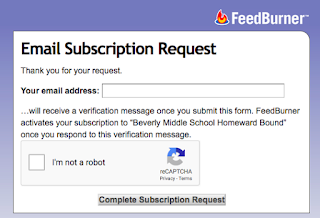 You must check your email inbox for a verification message from “FeedBurner Email Subscriptions,” the service that delivers these email subscriptions. The subject line is "Activate your Email Subscription to: Beverly Middle School Homeward Bound." You will need to click a link listed in this message to activate your subscription. If you don't see a confirmation e-mail in a reasonable amount of time please check your bulk/spam folder. You will not be on the list until you complete this step! This is to prevent someone from signing you up without your knowledge. If you want to UNsubscribe from this service (or from the old Briscoe Homeward Bound) you must click on the link at the bottom one of the daily digest emails, where it says "To stop receiving these emails, you may unsubscribe now." Still have questions? Contact Ms. Woznick, BMS Librarian at awoznick@beverlyschools.org.